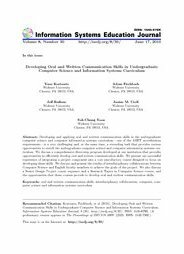 Abstract: Developing and applying oral and written communication skills in the undergraduate computer science and computer information systems curriculum - one of the ABET accreditation requirements - is a very challenging and, at the same time, a rewarding task that provides various opportunities to enrich the undergraduate computer science and computer information systems curriculum. We discuss a comprehensive three-step program developed at our institution that provides opportunities to efficiently develop oral and written communication skills. We present our successful experience of integrating a project component into a core introductory course designed to focus on developing these skills. We discuss and present the results of interdisciplinary collaborations between Computer Science and English faculty members to achieve the goals of the project. We also discuss a Senior Design Project course sequence and a Research Topics in Computer Science course, and the opportunities that these courses provide to develop oral and written communication skills.